We are investigating the potential for adding more capabilities for flying Avare in Canada. It would be helpful if anyone interested in this topic would post a message on our Forum, so we can gauge how many of our users fly Avare in Canada and would like to see more capabilities added. Also what specific capabilities might be most useful. Clearly, having official Canadian charts and data would be very popular and helpful, but to date we have been unable to obtain free materials of that kind. To fly Avare in Canada as of this writing (October 8, 2014), be sure you go to Map, Options, Preferences, Display, and turn on Show All Bases. That enables you to Find any Canadian destination that’s in Avare’s database and fly GPS direct even without any map displayed. To display a Canadian map, in the Download menu near the bottom is a category currently named “Topographic Maps(42)” which currently only contains Canada Grid maps numbered 1-114. 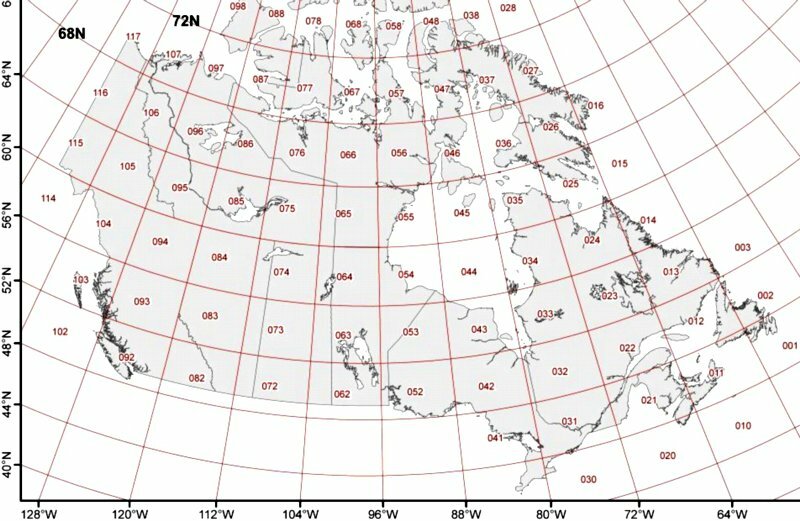 To find out which grid map(s) you need for the area you fly, consult this UNBC key map. Note that because this link was changed by UNBC recently, the key map linked to from Avare’s in-app Help stopped working and that will be fixed in the next Avare release. Meanwhile, here’s a small version you may find helpful. Click the map to see a larger version, and the original largest and complete version is available on the UNBC map link above. Note that the grids are numbered vertically in rows from East to West and South to North. If you find a better grid map online, please post about it in our Forum. In the current version of Avare, you might encounter some difficulty in switching between U.S. charts and Canadian Topo. If so, it might help to use Simulation mode if your current position is not in Canada. If that doesn’t help you might also Exit and restart Avare. We very much want to improve and add more Canadian capabilities in Avare, but receive very little feedback and few inquiries. If you fly Avare in Canada or would like to, please contact us on our Forum. •Avare AddOns - ADS-B, sims, ext.GPS, etc. •+Apps - A new section where you'll find apps for everyone (not just aviators). We invite you to join the aviators supporting all of our free apps. Please contact us if you'd like to volunteer your services. We also welcome any and all feedback or questions on any of our products, and it's most helpful for our developers and users if you contact us via our free Forum. Note that any negative feedback you share in a Play Store Review might discourage other pilots from trying our products, and given that they're free and improving very rapidly we hope you'll join us in encouraging pilots to try them out.